This numerical tour explores denoising of color images using a local multi-dimensional median. This is the sequel to the numerical tour Outliers and Median Denoiser. The median of n real values x is obtained by taking v(n/2) with v=sort(x) (with a special care for an even number n). It can alternatively obtained by minizing over y the sum of absolute values. This should be contrasted with the mean that minimizes the sum of squares. This allows one to define a mutidimensional median for set of points x(i) in dimension d by replacing abs by the d-dimensional norm. 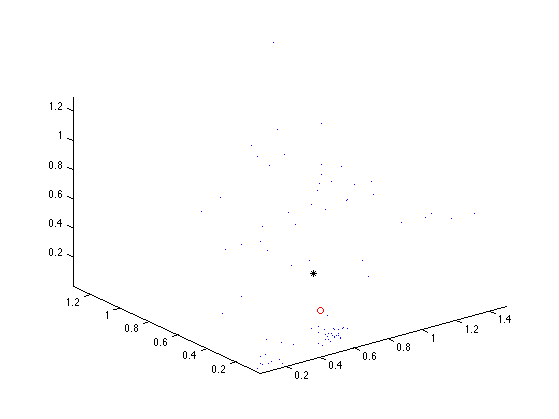 We define a Gaussian point cloud in 2D. 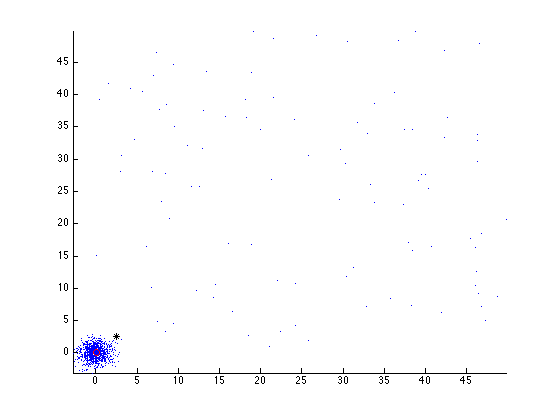 We modify some points as positive outliers (to shift the mean). We can compute the mean point. To compute the median in 2D, one needs to minimize the sum of norms. This is not as straightforward as the sum of squares, since there is no close form solution. One needs to use an iterative algorithm, for instance the re-weighted least squares, that computes weighted means. 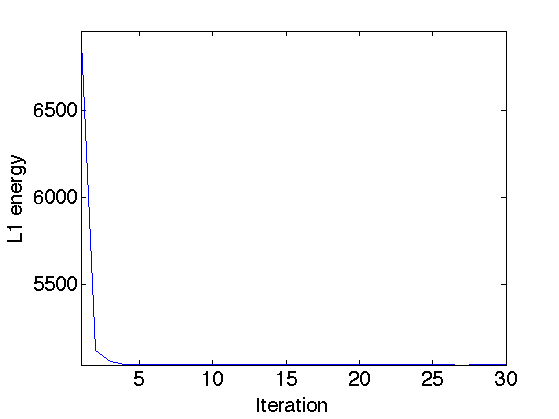 We can display the decay of the L1 energy through the iterations. We can display the points, the mean and the median. 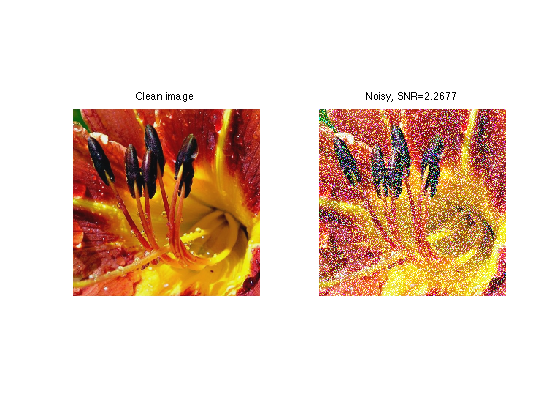 A median filter can be used to denoise a color image, by applying it to each channel of the image. We load a color image, which is an array of size [n,n,3]. We create a colored impulse noise by taking two Gaussians of different standard deviations. Add the noise to the image. Display the clean and noisy images. In the following, we use a fixed window width. 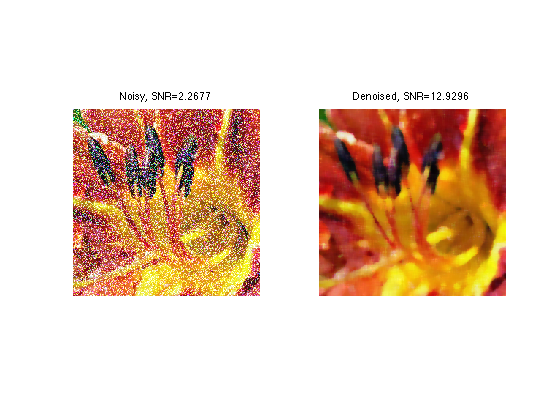 Exercice 1: (check the solution) A first way to denoise the image is to apply the local median filter implemented with the function perform_median_filtering on each channel M(:,:,i) of the image, to get a denoised image Mindep with SNR pindep. Another method computes a multidimensional median for patches located around each pixel of the image. First we extract the 3D points corresponding to the colors in the patch located around a pixel at a location (x,y). Exercice 2: (check the solution) Compute the median med of the points in X using the iterative reweighted least squares algorithm. This computed median med should be stored in the result as Mmed(x,y,:) (you need to reshape med so that its size is [1 1 3]). We can display the points, the mean and the median, in 3D. Exercice 3: (check the solution) Implement the 3D median filter by looping through all the pixel (x,y).